"It was humans involved with Amazon just like in Facebook," Combs said. "This is not an algorithm-based issue, they were making human policy decisions. And the issue at Amazon is not done yet. It's been escalated, and frankly I think many enterprise-clients view this as troubling because [it’s one thing] if you have legal speech that is simply protected and somebody files a complaint, but if it’s just as simple as saying ‘unwanted content' to take down an instance at AWS [Amazon Web Services], then nobody's safe." An email from Amazon Web Services to the group warned that they must remove a file containing the designs of Wilson's single-shot .380 Liberator pistol or their site would be taken down. "We've received a notice regarding unwanted content hosted on your AWS resources," the email said. "A copy of the complaint identifying the content in question is included below. Please review the attached notice and take appropriate action." "We were already moving so we were already starting on an AWS instance and we had already started migrating all of our stuff," Combs said. "We have multiple servers now. Their takedown literally said ‘unwanted content.' I guess if unwanted content is enough to get an AWS instance shutdown then I don't know how Amazon is going to sell that to their customers but we were already moving." The site remains live as of this publishing. Links to the site shared on Facebook, however, appear to be blocked. "Facebook did not just block CodeIsFreeSpeech.com prospectively. Facebook forced a company-wide (Facebook, Messenger, Instagram) takedown of content about and inclusive of CodeIsFreeSpeech.com," Combs said. "Facebook banned the URL throughout their products. I even tried to setup Facebook for Work. But even that platform banned discussion of CodeIsFreeSpeech.com. What we are experiencing is a complete ban on CodeIsFreeSpeech.com—not a ‘shadow ban,' not a reduced newsfeed presence, but a complete ban." Combs said when users attempt to share posts that include a link to CodeIsFreeSpeech.com, an error message appears, and the post is not visible on the user's timeline. An attempt by the Free Beacon to post a link to the site on a personal Facebook account resulted in an error message, and the post did not appear anywhere on that account's timeline. Combs said he doesn't believe there is any legitimate reason for Facebook to block links to the site. "The site is not malicious and no malicious files are hosted on it," he said. "We have the file checksums posted right on the site. We run forced full-time HTTPS. CodeIsFreeSpeech.com has been in many major mainstream news articles and televised stories over the past week. The site is definitely not SPAM and it's a verifiably legitimate operation with known participants." Combs said firearmspolicy.org/unblock-codeisfreespeech, a page set up to protest Facebook’' decision to block CodeIsFreeSpeech.com, has also been blocked by the social media giant. "There's a lot of folks in tech that are troubled by what Facebook has done," he said. "I mean outright banning a mention of CodeIsFreeSpeech.com is a pretty aggressive anti-speech move by them and I think internally they have some pretty tough questions to wrestle with here. If Amazon, Facebook, and Google are going to start censoring content that they think is optically problematic for them, then what's the point of net neutrality if the edge layer, if the rule service providers that hold our data don't let us see it anyway? They want net neutrality, but how about content neutrality at their level?" Facebook said sharing instructions for how to create a firearm from 3D printed parts violates their rules. "Sharing instructions on how to manufacture firearms using 3D printers or CNC milling machines is not allowed under our Community Standards," a Facebook spokesperson told the Free Beacon. "In line with our policies, we are removing this content from Facebook." Facebook also said it was in the process of updating their community standards to reflect the policy banning links to sites which include instructions on how to manufacture firearms. They said they view their new policy as in line with their current regulated goods policy which seeks to limit gun sales and exchanges to licensed dealers. However, Facebook did not answer why they view sharing of firearms blueprints as akin to the sale or transfer of actual firearms and did not respond to a request for an on-record interview. Despite the action by the tech giants, Combs said the publishing of CodeIsFreeSpeech.com has not resulted in any action by government officials or law enforcement. "As far as I know, we haven't received any government response whatsoever at any level," he said. "My opinion is, and I think that we're right about this, the settlement in Texas is binding. In my opinion, it was an unlawful injunction that was issued against the State Department, and the federal government in Washington doesn't stop the settlement from being effective. That settlement is in place, that's the law, and we're operating on that basis." Combs said even officials from California, where Firearms Policy Coalition is based, who have been vocal in their opposition to the publishing of the files haven't yet attempted to take any legal action against the group over the site. "We haven't heard from the states and local governments either, and it's kind of shocking that they talk about all of this stuff but they don't really do anything about it when they have an opportunity," Combs said. "They take an easy path to go after the Trump administration, maybe this is all part of their resistance narrative but they could've said something about Code Is Free Speech and they haven’t yet." Combs said the files posted to the site have long been freely available on a number of websites online, but the group thought it was important to publish them again. "We wanted to make a bold statement that you can't silence us as a whole, as a collective people that are interested in freedom," he said. "If you're going to go after Cody and Defense Distributed then you're going to come after us too." Gun-control proponents have warned of the dangers they see in the publishing and sharing of gun designs on the internet in recent weeks. "Anyone, including terrorists, convicted felons, and domestic abusers, with an internet connection can download these files and use a 3D-printer to make a nearly endless arsenal of untraceable and undetectable weapons," the Brady Campaign to Prevent Gun Violence said in an email to their supporters last week. 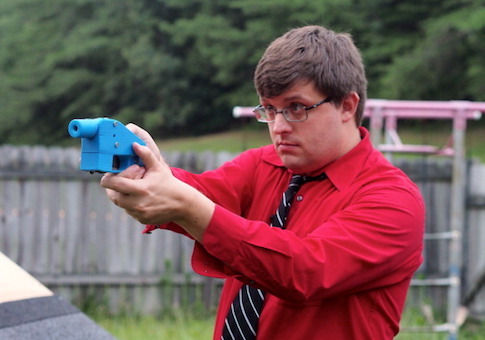 "Cody Wilson is dedicated to growing his library of 3D-printable guns, making them available to anyone, anywhere. We cannot overlook the danger to us all by making guns downloadable to dangerous people." Combs said he disagreed with the idea the files are too dangerous to publish because they may be misused by criminals. "This is simply nothing new," he said. "The Anarchist Cookbook you can buy on Amazon, UC Berkeley is hosting a copy of it. YouTube has a Vice video where they were making bombs from the Anarchist Cookbook and testing them out. So, people's hand-waving and wailing and gnashing is irrational and doesn't change the realities of the world. I also think this is protected speech, bottom line, period. People will do bad things because that's what they do, and this doesn't change that." Combs went on to say that he believes all constitutionally protected rights are dangerous in their own right. "I've said for many years the reason why we have a Bill of Rights and a 14th Amendment is because rights are inherently dangerous. If they weren't dangerous then we wouldn't need to protect them in the very fabric of our social contract. All rights are dangerous. The right to counsel is dangerous, the exclusionary rule is dangerous, the suppression of evidence, a speedy trial, these are all dangerous rights. I believe all rights are dangerous, and that's why we have to protect them." Going forward, Combs said the group plans to publish more gun-design files and information. "The future is we're going to be publishing very soon a ton of additional files and information, and as soon as I get that done, it's going to be live," Combs said. "We don't plan to stop and as long as people are willing to share protected speech, we're going to empower that." UPDATE 2:45 P.M., Thursday 9 August: This piece has been updated to include further comment from Facebook.